The health benefits of black beans include the prevention of cardiovascular diseases and a reduced risk of certain types of cancer. Consuming black beans can also aid in digestion and the regulation of the body’s blood sugar levels. Black beans can be beneficial for various nervous system functions, can reduce the chances of birth defects, neutralize the negative effects of sulfites, and even prevent impotence in men. Black turtle beans, more commonly known as black beans, are shiny, black members of the bean family Phaseolus vulgaris. They are most commonly found in and have been popularized by Latin American cuisine, and are known by many names in various cultures throughout South and Central America. There are six main types of black turtle beans, with relatively similar appearances and nutritional values. Although they have been cultivated and cooked for thousands of years in South America, black beans did not cross the Atlanticuntil the 1500s in the boats of European explorers. The general form of black beans can be changed without losing the nutritional benefits, although some may be lost when they are made into soups or when ground up and exposed to high temperatures. The widespread growth and low cost are what initially made black beans a cultural staple in South America. However, as more information is being gained about the health benefits of black beans, more people are including them in their diet. One popular preparation technique is to soak black beans in water before cooking or eating them. Studies have shown that by allowing the beans to soak in water, certain phytates and tannins are removed, which lowers the nutrient availability, and the beans also retain beneficial resistant starch while losing some of the total carbohydrate content. In some parts of the world, beans are given an independent box in the Food Pyramid, because they are such a vital part of those cultural diets. They are very popular among vegetarians because when they are combined with brown rice, a complete protein meal is formed. A common problem in vegetarian diets is acquiring proper amounts of protein, so black beans and brown rice can be a simple and inexpensive solution. Black beans are very high in fiber, protein, and vitamins like vitamin A. They also contain calcium, iron, and manganese. Black beans also have high levels of flavonoids, particularly anthocyanin, which have antioxidant abilities. They also contain omega-3 fatty acid, which is considered a good form of cholesterol. Black beans are a great source of folic acid and have abnormally high levels of the rare compound molybdenum, which is very difficult to find in any other food. 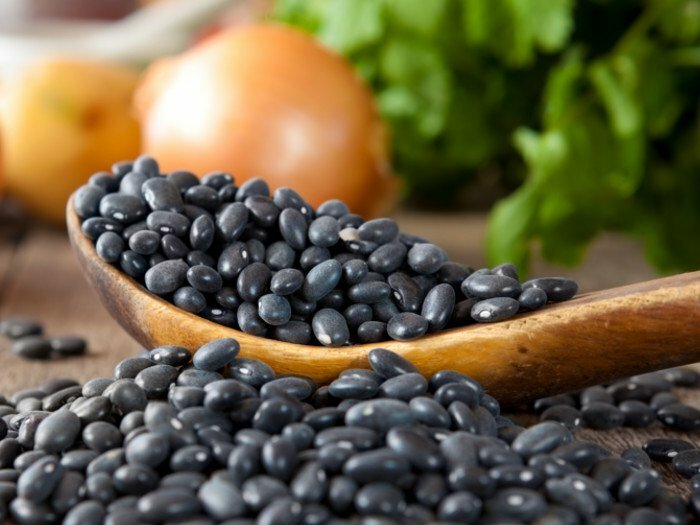 One of the best benefits of adding black beans to your daily or weekly diet is the high level of fiber that they contain. They have high concentrations of soluble fiber, which has been proven to help lower blood cholesterol levels. Soluble fiber attracts water and turns into a gel during digestion, whereas insoluble fiber adds mass to food and helps it pass through the digestive system faster. Lowering blood cholesterol can reduce thickening of the artery walls, which in turn can prevent heart attacks and strokes. Black beans also have small amounts of omega-3 fatty acids, which are good forms of cholesterol that balance the negative effects of omega-6 fatty acids, which are the bad form of cholesterol. They have anti-hypertensive effects, which means that they can improve blood flow, lower blood pressure, and put less strain or oxidative stress on the cardiovascular system. Black beans have been shown to reduce the risk of certain types of cancers due to the flavonoids found in their seed coat. There are eight different flavonoids that have been found in the seed coat, and three of them are anthocyanins. Flavonoids are basically color-producing phytonutrient pigments that function as antioxidants in the body to fight disease and free radicals. Anthocyanins are great for preventing cancer. They can effectively inhibit blood vessel growth to cancerous tumors, slowing the growth of cancerous cells and increasing the speed of apoptosis (cell death) within cancer cells. The anthocyanins, along with all the other phytonutrients found on the seed coat, make black beans a very powerful weapon in the fight against cancer. Black beans are great for treating digestive issues because they contain high levels of protein and fiber, making them a “superfood”. Protein and fiber help food move through the digestive tract, allowing it to eliminate waste in a healthy way. They are also digested slower than meat, which has a similar protein content, so eating beans can leave you satisfied for longer. Uneven digestive rates can cause unbalanced blood sugar levels in the body and black beans regulate this issue as well. As mentioned above, the fiber and protein in black beans keep digestion at a steady rate, so concentrated doses of nutrient uptake do not occur. Rather, a steady absorption of nutrients occurs throughout the digestive process. When digestion is unsteady, spikes or crashes in blood sugar can occur, which are dangerous and even fatal to patients with diabetes or similar blood sugar-related conditions. Also, molybdenum has been shown to reduce impotence and erectile dysfunction in older men when regularly consumed. This rare vitamin has regularly been linked to increased energy and interest in sexual activity in older men. Black beans can also improve the functioning of the nervous system by helping provide the necessary amino acids and molybdenum. They contain high amounts of vitamin B9 or folate. Folate, also known as folic acid, plays a key part in the regulation of specific amino acids required by the nervous system. Studies have shown that the deficiency of dietary folate leads to an increase in homocysteine levels, which can be a dangerous precursor to neurodegenerative diseases like Alzheimer’s disease and Parkinson’s disease. Regularly adding black beans to your diet can provide the necessary folate content to levels in your body and reduce the risk of such diseases. Another benefit of folate, which is found in such high levels within black beans, is its role in protecting infants in the womb. The folate levels in a woman’s body are integral to the normal and healthy development of the fetus, particularly its brain and spinalcord. Thus, black beans are highly recommended for pregnant women. Phytic Acid: Beans have natural seed coats that protect their nutritious contents from predators and insects while growing in nature. One of the components of that seed coat is phytic acid, which protects the seed from premature germination. If the phytic acid is not removed from the bean before eating, it can bind to common minerals like calcium, magnesium, and copper, preventing them from being absorbed as nutrients in the body. These unabsorbed minerals can build up and cause different conditions, from small irritations like digestive irritability to more serious issues like hormonal disruption and impaired brain function. Basically, cook your beans, and make sure they are soaked in water to neutralize the harmful effects of phytic acid! Oligosaccharides: Black beans contain a complex sugar called oligosaccharides, and the human body does not produce any enzyme that would naturally break that sugar down. Therefore, oligosaccharides ferment in the digestive system and begin to produce methane, which is released from the body in unpleasant ways. Again, soaking the beans in water and making sure that they are cooked can greatly reduce a number of oligosaccharides in the beans, along with reducing all of the other organicparts of beans that are difficult to digest.